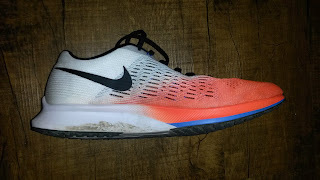 Thus far in my shoe reviews you have likely seen my "Thoughts as a DPT" section where I attempt to elaborate on how my training as a Doctor of Physical Therapy influences how I analyze footwear. I have decided to start expanding on that specifically looking into footwear mechanics to teach all of you some of the things I have learned both as a DPT as well as from my experience in the footwear world. So keep an eye out for more "Footwear Science" posts. The first thing I would like to address is one of my pet peeves in footwear design: the posterior aspect of the heel. Generally when I look at this area, I am looking to see how far back that section of the shoe protrudes/extends in the posterior direction or if it is nice and curved. When the back of the heel protrudes backwards, this is generally called posterior heel flare. Some footwear companies do not have a posterior heel flare and instead have a curved heel with no protrusion in the posterior direction. This is also called a beveled heel. I tend to prefer a shoe with a more beveled heel as it matches the shape of your heel bone, also known as the calcaneus. One of the hypothesized reasons for the heel being rounded on the foot is to help progress you forward and maintain forward momentum while walking. Walking gait is characterized by heel striking during initial contact (aka landing). A curved heel helps roll you and your foot forward and actually makes the body more efficient. This means you do not have to work as hard to keep moving forward. The curvature to the heel rocks you forward, which is why the shape of the calcaneus is considered the rocker system of the foot (I have touched on these before and will do so more in future posts). Without it, you would have a jarring impact with each landing and it would place excessive forces into your shin muscles (specifically your anterior tibialis and ankle dorsiflexor muscles). The more protuded posteriorly the heel is, the longer arc of motion your foot has to travel when you heel strike. The longer arc of motion your foot has to travel, the harder your ankle dorsiflexors have to work to control that motion. This is called an eccentric motion as they are contracting while being lengthened, attempted to slow the transition of the front of the foot down to the ground. Individuals with weakness in these muscles can commonly have a "foot slap" as the foot hits the ground loudly due to a lack of control. During a heel first landing, the muscles in the front of the lower leg, aka pre-tibial muscles, must control the downward motion of the foot as the foot transitions to a "foot flat" position associated with the middle of the stance or contact phase of running gait. My other issue with posterior heel flare is that if you do land with a heel strike type running pattern, you will hit the ground prematurely. The muscles in your legs turn on before you hit the ground to prepare for impact. I would hypothesize (have not seen research about this) that a posterior heel flare would cause early landing, loading your joints before your muscles are ready. The muscles are the major protectors of the joints when it comes to loading forces. If you land before you are ready, they will absorb less force and the joints will absorb more. So knowing that a posterior flare puts additional pressure/work on the pre-tibial muscles (aka shin muscles) and potentially the joints, imagine repeating that increased workload for multiple miles while running. 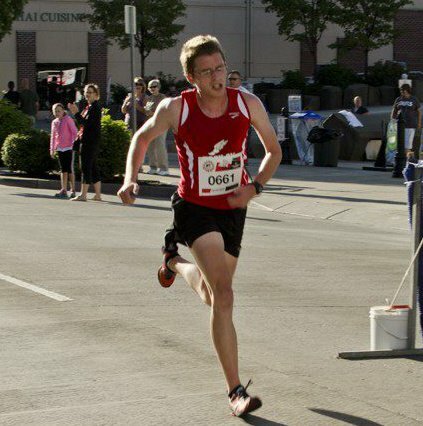 Running is different than walking in several ways, one of which being the increased loading forces. While walking is generally accepted as loading the body with forces approximately equal to body weight, the impact forces of running can equate to 3-4 times that. So for those that land on their heel during a heel striking gait, imagine how much more tension will be put through those muscles? I am not debating which footstrike is best or even if there is a preferred one in this post. What I am trying to say that a posterior heel flare is something I would steer my patients/clients away from if they tend to run with a heel striking gait. Those individuals with a history of shin splits (or medial tibial stress syndrome) are definitely a group I would steer away from a posterior heel flare and to a shoe with a more beveled heel. My reasoning as to why I would push toward a beveled heel would be to decrease the already high work of their pre-tibial muscles and improve their transition during heel strike. For those that land mid/forefoot, they will not likely have to worry about this aspect of the shoe as they will not be loading it (as much). That is why in the case of the Nike Zoom Elite 9 (first photo above, orange/white shoe), it doesn't matter as much. The Zoom Elite series was designed for more uptempo training and runners with a more anterior landing pattern. 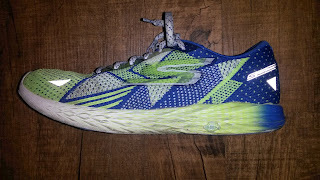 Luckily in that shoe, the sole compresses very well, but I would still steer many heel strikers away from that shoe and into another lightweight trainer like the Skechers GOmeb Razor (REVIEW), which has a decent but not overdone heel bevel. So there you have some of the reasoning behind my thoughts on the posterior aspect of the heel. I usually prefer that companies bevel the heel to attempt to match the shape to the posterior aspect of the calcaneus/foot. 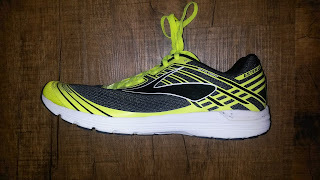 While I am not expecting a minimalist or barefoot type shoe, I believe that footwear should work with the body and not against it. Most companies are doing this well, with notable ones being Skechers Performance, Hoka and Brooks. Others do it not necessarily as consistent. Certain companies in particular have no heel bevel and have also not changed their design in 10-20 years. I encourage both runners and footwear companies to choose wisely in the shoes they run in and produce. Footwear is your direct contact with the ground and while no shoe can prevent injury, they can definitely contribute to one. Powers, C. (2017, February): Implications for Movement Dysfunction and Musculoskeletal Injury. Functional Biomechanics of the Lower Quarter. Lecture conducted from the Movement Performance Institute, Los Angeles, CA.